This column answers readers' questions about horses. Anything is fair game, from questions about equine health to how to get along with the other boarders at your barn, to general horse keeping. If we don't know the answer, we'll find someone who does. What causes a horse to have white hairs mixed in his coat? My horse is an 8-year-old chestnut Thoroughbred, but when you look closely, you can see that he has a lot of white hairs mixed in with the red ones especially on his rear quarter. Why is that? 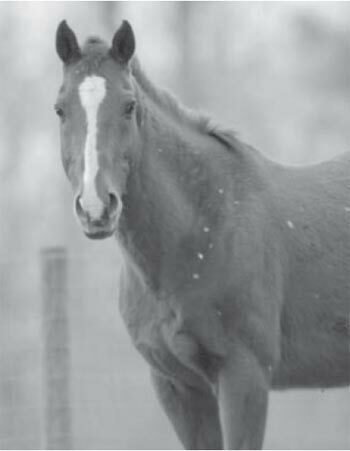 We sent your question to Dr. Phillip Sponenberg, DVM, who is the author of the book Equine Color Genetics, published by Wiley-Blackwell, now in its third edition (2009). Dr. Sponenberg replied that there are many different ways that a horse can have white hairs mixed in a solid colored coat. "There are a few specific genes that add white hairs in, like grey or roan," he wrote us via e-mail. "I'll bet that's not what the question is, though." Horses with the "grey" gene are generally born colored (bay, chestnut, black and so on) and they progressively acquire more white hairs as they age, often passing through a dappled grey stage. There are two main types of grey: those that lose pigment in their mane and tail hairs as they age, and those that don't. The former can end up looking completely white when they are older (think of the white Lippizans) while the latter tend to keep some dark areas, especially on their legs, and may stop getting greyer at some point in their lives. No one has identified an actual genetic difference between the two types. The gene for greying can be thought of as a switch that is either on or off: a horse may be genetically a bay or a chestnut, and if he also has the "grey" gene switched on, he will become a grey. If the gene is switched off, he will not go grey. Grey is a dominant gene. This means that, in order to be grey, a horse must have at least one grey parent. It does not mean that all grey horses will have grey foals, or even that the offspring of two grey horses will definitely be grey, since the parents will not necessarily pass their grey genes on to their progeny. Horses with the "roan" gene are born with white hairs mixed into the base color of their coats. They don't get progressively greyer with age, and they generally don't have much or any roaning on their heads, manes, tails or lower legs. Some roan horses may get darker as they age. The gene for roan, like the gene for grey, is a separate on-or-off switch. A horse may have a coat of any base color, and if the roan gene is switched on, that color will be mixed with white, giving the horse a new color. Black with roan makes a blue roan; bay with roan makes a red roan; chestnut with roan makes a strawberry roan and so on. The gene for roan is not as common as the gene for grey, but it occurs in many breeds. It does not, however, occur in Thoroughbreds: if your Thoroughbred's papers say he is a "roan" this usually means that he is genetically a grey. Roan is especially common in some pony breeds, draft breeds, and Spanish breeds, or breeds with Spanish ancestry. (Think of the Quarter Horse.) Like the grey gene, the roan gene is dominant. A roan horse must have at least one roan parent. A chestnut Thoroughbred with Birdcatcher spots. No, he is not an Appaloosa. There is also another roan-type pattern called rabicano, a word which comes from archaic Spanish meaning "white tail." In the west, rabicano horses are often referred to as "skunk-tailed." They generally have rings of white hairs at the top of their tails, along with roaning that is generally limited to the barrel and the flank. True roans get darker as they age, but rabicanos tend to get lighter. Rabicanos might have just a little white hair, or they might have so much that they appear to be true roans – the gene for rabicano might even be turned on in conjunction with the gene for true roan. It is often associated with a type of pinto-type coloring called Sabino, which tends to cause high white socks, a wide blaze and small white patches, usually on the barrel. Rabicano roaning may also be more prevalent in chestnut horses. Rabicanos occur in breeds that do not have true roans, such as Arabians and Thoroughbreds, but the genetics are not yet well understood. If your horse has some white at the top of his tail, and if the majority of the white hairs in his coat are near his flank and stifle, he might be a rabicano. Another type of white pattern that can occur in Thoroughbreds is called Birdcatcher spots. Birdcatcher spots are distinct white spots that crop up anywhere on the horse's body. They can be just a few hairs, or they can be spots the size of a quarter or larger. Horses with a lot of Birdcatcher spots might even look like snowflake Appaloosas, though this kind of white spotting is not related to the genes that cause Appaloosa coloring. Birdcatcher spots are not well understood, and they may even come and go throughout the horse's lifetime. They are probably under genetic control, since they seem to run in some families, but no one has established exactly what their genetics are. They are named for an Irish racehorse named Birdcatcher who had the spots. He was born in 1833, won six major stakes races before being retired to stud, and was among the leading sires in Great Britain. He stood for 23 years before his owner, William Disney, had him put down, at age 27, for being unable to cover "the good sized mare" Queen Bee. Finally, some horses have random white hairs scattered in their coats. They might appear to be solid colored, until you examine them very closely, when you will notice an admixture of white. Horses with this kind of white in their coats are "a bit more confusing" writes Dr. Sponenberg. Although there may be a genetic component, "I don't think anyone knows why this happens to some horses!" So now that we have given you the long answer to your question, here is the short answer "No one knows." Yet. There are currently many genetic studies being done on horses, especially through the Equine Genome Project, which is a cooperative international effort being carried out by hundreds of scientists in over 20 countries. One goal of this research is to discover new therapies for equine diseases such as laminitis. Another goal is to understand human diseases more completely. Equine genetics can help: scientists at Uppsala University in Sweden studied the greying gene, which they determined to be caused by a single genetic mutation that they traced back to a single common ancestor. Horses with the greying gene are predisposed to a certain type of benign melanoma that may turn malignant. ("Grey horse cancer.") By studying grey horses and their genes, the scientists hope to be able to discover the molecular pathways and regulatory mechanisms that lead to tumor development.